Mark Smith – breednet.com.au. 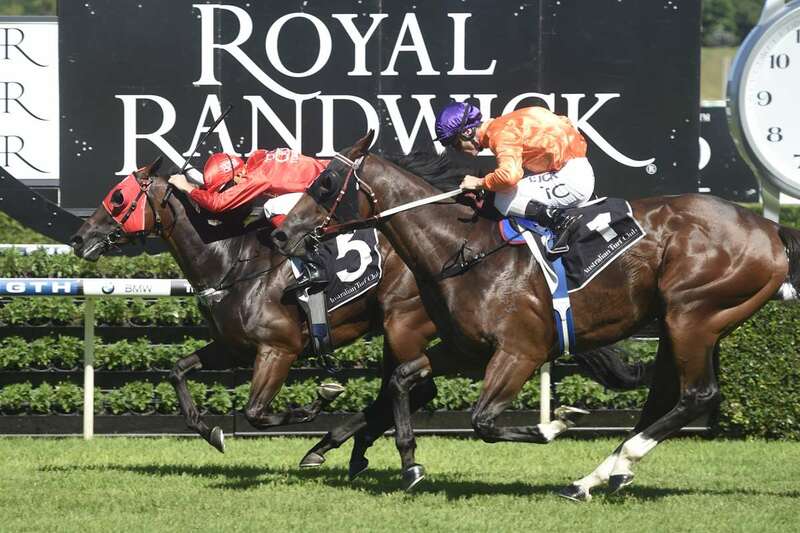 The winners circle was packed out after Triple Crown’s Snitzel gelding Redzel broke through for a well-deserved maiden stakes win in Saturday’s Listed Fireball Stakes (1100m) at Randwick. Winless in six starts since defeating the future Group 1 winner Japonisme at his career debut at Warwick Farm 12 months ago, Redzel led all the way under Hugh Bowman to hold the challenge of the Gary Moore-trained Takedown (Stratum) by a neck with Egyptian Symbol (Stratum) three and a quarter lengths back in third. The Peter and Paul Snowden-trained three-year-old was gelded last spring, which seems to have put his mind back on racing. “Probably the biggest thing has been the gelding. His first two runs were full of merit,” Paul Snowden said. “Hughie has had a fair bit to do with this horse, he’s been riding him aggressively and it’s really switched him on. “There’s no use holding him because he’s not going to find five or six lengths, you have to go with him at his speed which gets everything else out of their comfort zones. “It’s all about gaining confidence, especially a horse with his ability and today was a very tough win. A $120,000 purchase by Triple Crown Syndications from the draft of Marquee Stud at the 2014 Magic Millions Gold Coast Yearling sale, Redzel is the tenth living foal and second stakes-winner for the former top-class Rubiton mare Millrich. Winner of the Group III Sweet Embrace Stakes, Millrich was placed in the Group 1 Golden Slipper, Group II Silver Shadow Stakes, Group II Magic Night Stakes and Group II San Domenico Stakes. The daughter of Rubiton is the dam of the Group III winner and very accomplished stallion Danerich which may have made the decision to geld Redzel all the more difficult. A sister to the dam of the talented El Roca (Fastnet Rock) Millrich died three weeks after foaling Redzel who becomes the 36th stakes-winner for Arrowfield Stud’s high-flying Snitzel.